The team covered the length and breadth of Wales, delivering workshops, training and presentations in 9 of the 22 local authorities. working with a total of 1,728 young people. We also delivered training to student teachers in 2 universities. 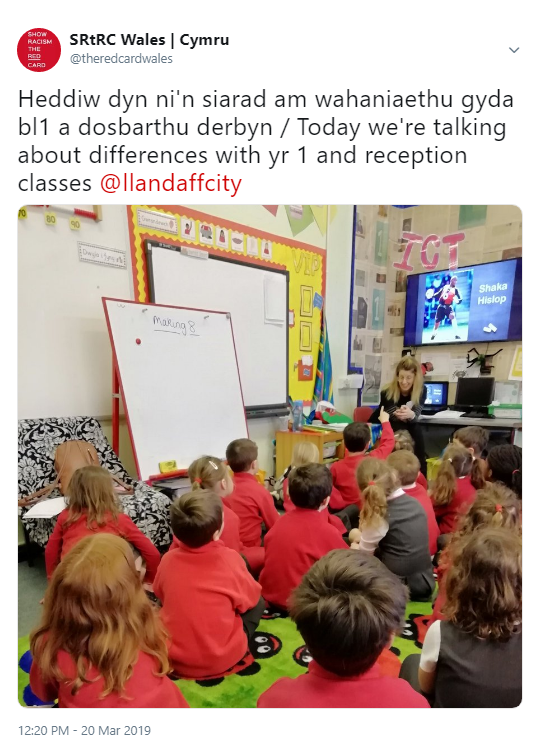 March saw us complete a Welsh Government funded project to deliver school workshops in each of the local authorities in North Wales, 3 sports clubs and provide training for 48 teachers and other education providers in Wrexham. (See our article North Wales Teachers Show Racism the Red Card. Alongside our work in schools and universities, during March, Team Wales attended an event with Cardiff City FC Foundation, celebrating ten years since their launch, a UNISON conference in partnership with Velindre cancer hospital, 3 Welsh Government consultation events, a multi-agency forum and a meeting of the recently-formed Race Alliance Wales and delivered a session in a training day on tackling extremism at an event organised by Cardiff County Council. We also delivered a presentation on racism in Welsh schools at a conference organised by EYST (Ethnic Youth Support Team) and RAW (Race Alliance Wales). March has been one of our busiest months ever, but Team Wales is up for the challenge and full of enthusiasm for more busy times in the months to come.